'Where to start?' is a question that plagues How to Be Both. And so it seems rather fitting that, as I'm sat here writing this review, it's the question on my mind. So, where do I start? With George or Franchescho? With what lies beneath the painting or the painting itself? To anybody who has yet to read this book, I'm probably making very little sense. And yet, How to Be Both isn't a book written to make sense. I don't know exactly what it is or why it is, but these seem like entirely the wrong questions, so I'll just say I'm glad it is. MY THOUGHTS: How to Be Both is a prime example of art echoing art. It's told in a way that imitates a fresco's technique – in which there's an original painting underneath that could, potentially, tell an entirely different story to that of the painting on top. And so here we are with our two tales: the 15th century renaissance artist and George. Two tales which appear in a different order, dependent on which edition you receive – personally, my edition began with the renaissance artist. Two tales which are, whilst brilliant on their own, inherently linked to each other. And what a fascinating structure this was. The blurb says it all; two tales of love and injustice really do twist into a singular yarn where time gets timeless, structural gets playful, knowing gets mysterious, fictional gets real. And this distortion of fiction is precisely what makes Ali Smith a genre-defying storyteller. My only problem with this technique? How to Be Both is not a book I can reread with an empty mind. The tales of Franchescho and George are unforgettable to an undeniable degree. And so, because I've already read the book with Franchescho's tale first and George's second, I've missed out on the experience of reading it the other way round. I've missed out on an entirely different book in which George's tale is, in fact, the painting that lies beneath. That said, Ali Smith excels when it comes to the present, so there's a part of me that's unashamedly smug that my edition ends on the wonder that is George's story. As a 21st century teenager reading this book, the credibility of George's character can't go unmentioned. For me, her tale was the richest; her relationship with H and the constant distortion of the present paired with the smaller details like the use of Latin and the motif of the double helix allowed her tale to resonate with me. Simply brilliant. And yet the genius of Franchescho's tale can't go unmentioned either. Smith's ability to mould and play with words, positioning them across the page in such an evocative way is a testament to how unusual her storytelling method is. Yes, I preferred George's tale, or felt more connected to George's tale, but perhaps this is down to the fact I read it in the context of Franchescho's tale – which proceeded it in my edition. From mirroring the fresco's technique to the cover of the book, every detail of Smith's work is essential towards painting the wider picture. For me, How to Be Both is exactly what it sets out to recreate: a masterpiece. In the best possible way, of course. And it has to be doesn't it? To make two tales, with a difference of over five centuries and half a continent, fit together in such a profound manner. Besides, I wouldn't be lying if I said Ali Smith is, perhaps, the most interesting and intriguing novelist alive today. Sounds SO interesting! I love anything sat in the 1960s. Glad you enjoyed this. Haha it certainly is. ;) The structure is simply fascinating! This book sounds fascinating. Especially the idea of the fresco structure and the alternate beginnings. Plus I absolutely love the “art makes nothing happen in a way that makes something happen”! I'll be looking out for this at my local library! There's another great quote, although not about art “It was all : it was nothing : it was more than enough.” Definitely a thought-provoking read! Although sometimes i find with these kinds of books that they're littered with too many profound quotes and not enough plot, if that makes sense? I definitely know what you mean. 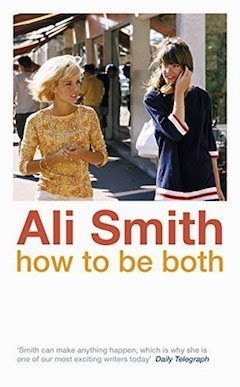 But, in this case, I think Ali Smith got the balance just right! Seems like such an interesting and thought-provoking read. Your reviews always make me want to pick the book up!